As Facebook and social media have become more prominent in our daily lives, businesses have been moving into the social media arena in search of customers. At Knowmad, we've explored Facebook and decided it's not the ideal avenue for us but it's not to be ignored. Why? Customers and prospects typically don't look for us on Facebook because we sell to businesses (B2B), not consumers. 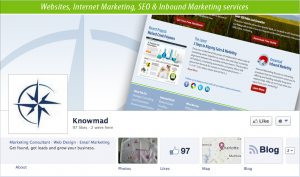 However, a company or individual could create brand confusion by presenting themselves as Knowmad on Facebook. In addition, we might later find a use for Facebook in our marketing and we don't want to lose the opportunity to claim our brand name. How did we decide on the use of Facebook for our brand? I've included a few questions in this post that helped us evaluate if Facebook is right for our business. Hopefully, these questions can help you start the conversation for your business. Before holding this discussion, we defined our primary target audiences to make the conversation more effective. Is our target audience on Facebook? Yes. However, it's not likely that our target audiences are looking to engage us on Facebook. We serve other businesses and our brand isn't for general consumers (B2C). Can Facebook drive traffic to our website or blog? Maybe. It's more likely that we can get more targeted traffic from Linkedin using our blog posts. Would anyone buy from us on Facebook? No. Knowmad doesn't sell products. Our selling process is relationship-driven and not transactional. Is Facebook a good recruiting tool for us? Perhaps. It's not the most efficient approach to recruiting because of our specialized need for highly skilled web strategists, web hackers and web savvy designers. We could spend quite a bit of money with little return. If we increased our followers, what would happen? Nothing noticeable from a business perspective. Is there any benefit to us to use Facebook? Yes. We don't want someone poaching our brand name on the most widely used social network. However, this doesn't warrant spending a lot of time on Facebook vs. other marketing opportunities. These are just a few questions that could be asked about Facebook for a B2B business. The answers to these simple questions helped us quickly decide that our marketing efforts would be more effective using other avenues. There are a lot of ways we can market our businesses, both online and offline. Given the time and budget limitations that we have, it's important to make sure that we're spending our time and marketing dollars wisely.